In honor of National Mentoring Month, Mary Green of Parkway Place is sharing how mentoring benefits senior adults. 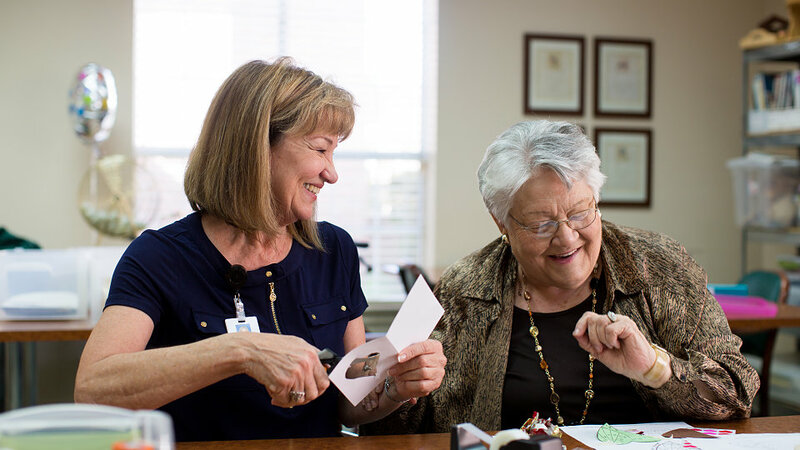 Mary serves as the life enrichment coordinator at the Houston senior living community. We’ve all heard the adage “you can’t judge a book by its cover.” I’ve never found this to be truer than in working with senior adults. Some may look frail, but they are full of the richest wisdom, sharpist wit and deepest relationships I’ve ever seen. It’s no surprise, then, that senior adults should be at the top of the list for anyone looking for a mentor. Be it a specific skill, career direction or general life advice, senior adults have so much to offer. When it comes to seniors, though, the benefits of mentorship go both ways. An understanding of why age is just a number. Developing a relationship with a senior adult teaches young people that you don’t lose your intellect or sense of humor when you age. Improved communication skills. Talking to a senior adult is a learned skill. Conversation must be loud enough in case of hearing issues, but soft enough to not be patronizing or insulting. A bigger picture. Senior adults, obviously, have a lifetime of experiences from which to draw. Unlike any other mentor-mentee relationship, they have a greater understanding of life’s bigger picture. A sense of purpose. After retirement, older adults often feel like they have nothing to contribute to society. Giving them a sense of purpose can literally add years to their life. Intellectual stimulation. An intentional relationship like mentoring gives older adults something to think about and plan for, much like they would for a job. A renewal of faith in the future. Older generations can fall into the habit of thinking that all “kids” are lazy. To meet a young person who is motivated to learn something, however, can correct those stereotypes and give hope. An identity outside of family and friends. To be in a mentor relationship where you are no longer “so-and-so’s grandmother” or “Mr. So-and-so’s widow” but are known simply as yourself helps with self-esteem. Above all, the greatest benefit of mentorship for both sides is the breaking down of stereotypes. It may be human nature to put people in cubby holes and assume that a 90-year-old behaves one way while a 15-year-old behaves another. However, we have more in common with one another than we think. The best way to find out just how much is by building relationships. To get connected with a senior adult at your local Buckner senior living community, contact 800-381-4551 or email us here.